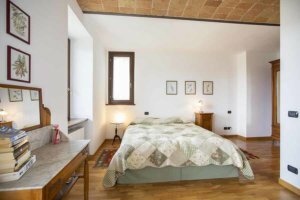 Stay with Giovanna Oliveri in her home Cascina Bricchetto Langhe, Built of Langa Stone on top of a hill surrounded by vines and groves. 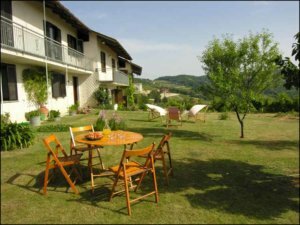 She offers two guest houses on the site so you can enjoy the beautiful area of Langhe with its traditional life, its walks and its wildlife. The Langhe (southern Piedmont, Italy) is a territory famous for its wines (Barbaresco, Barolo, Barbera …), for the Alba white truffle (international fair in October and November), for cheeses, hazelnuts and many other products of absolute excellence. Little known the beauty of the territory, the breathtaking views, the typical architecture and the villages perched on the hills that have been included by UNESCO in the World Heritage of Humanity. Our territory is particularly stimulating for the rich sensory experiences that it offers. I find that women seem more able to seize the best of a stay by discovering and getting in touch with their own senses. Giovanna is one of the fabulous hosts on our Womens Accommodation Network – adding a richness to women’s experiences as they travel by staying with other women. She is available to provide further information and organizational support so that the stay at Cascina Bricchetto Langhe is unforgettable! The curiosity of Women is the spring that allows you to discover the culture, beauty and the “good” in this area. Instead of chasing a status symbol such as “I drank Barolo wine in one of the wine cellars of the production area”, women are able to understand the complexity of that difficult wine, while many other wines (Barbera, Dolcetto, Nebiolo, Moscato …) are easy and immediately enjoyable. Giovanna offers cooking classes to guests on request. She is very happy to help you plan your stay and arrange visits to the wineries with wine tasting and small producers of cheese-salumi and sweets.